An oral history of the legendary reggae singer, drawn from interviews with more than seventy-five friends, business managers, relatives and confidants?many speaking publicly for the first time. 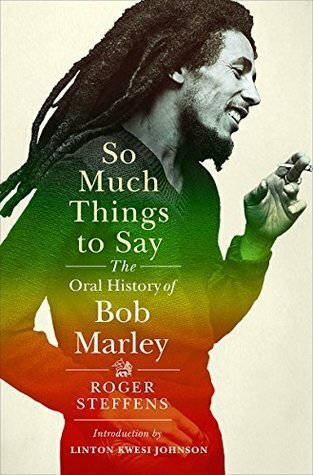 A rich new oral biography called So Much Things to Say, by the reggae scholar Roger Steffens, narrates the life of Marley from cradle to grave through interviews Steffens has collected over the years from Marley, his mother, his wife, his last girlfriend, several of his children, his musical partners Bunny Wailer and Peter Tosh, and many more. Steffens has been on the Marley case for decades, and he’s a crucial voice in this epic chorus ... The book digresses at times into trivia for the superfans — we learn that Marley’s favorite meal was Irish moss, a form of seaweed — but there’s a lot that’s illuminating. There is an immediacy to related experience that casts rumor and exaggeration into distorted shadows. How many words have been written about 'No Woman, No Cry,' and how pale do those stories look when the actual circumstances of its composition are related? The outlines of Marley’s well-known life history are present in this book. But here, like in a historical novel, we discover new details. Marley is not a demigod here, but an unwanted boy who fell upon the gift of brightening the world ... So Much Things to Say reveals a Marley of flesh and blood who passed too young in a world that was never too old to learn. 'In the abundance of water, the fool is thirsty,' the singer said, and there is water aplenty here. Drink and be satisfied. What emerges isn’t a different Marley so much as one who feels a bit more human, given to moments of diffidence and whim, whose every decision doesn’t feel freighted with potentially world-historical significance ... Steffens generally resists hagiography ... In contrast to other popular Marley books, in which every detail merely anticipates the singer’s eventual breakthrough, Steffens’s contribution is his nerdish monomania...Steffens is largely here to direct traffic. But his authority derives from exhausting every possibility. What did you think of So Much Things to Say: The Oral History of Bob Marley?